New Zealanders attending two New Year's celebrations will be able to pay for food and drink with just a wave of their hand. The La De Da festival in Martinborough and the Rhythm and Vines event in Gisborne are planning to use a cashless system using radio-frequency identification (RFID) wristbands that will come preloaded with electronic money. Event organizers hope that the new system will enable them to gather information on financial transactions more easily and prevent the sale of alcohol to known troublemakers. Quote: “Partygoers will be fitted with a wristband on entry to the two sites, which will be preloaded with wireless money. They can then pay for items such as food and drink simply by flashing their wrist against a point-of-sale terminal. As a result, organisers will be able to see where money is being spent and also find it easier to block the sale of alcohol to people who have been highlighted as troublemakers. In other news, SanDisk, the company that manufactures the SD memory cards, have announced that they are planning to integrate GlobalPlatform smart-chip technology into their products. This would enable the information on the memory cards to be electronically protected, allowing the chips to store sensitive information on them such as credit card details or biometric information. Smart applications could be stored on the card, enabling a mobile phone or similar device to be used like a credit card, thus eliminating the need to carry cash. Quote: “The press release said that the new new smart-chip enabled SD cards in mobile phones could be used to further bring about the advent of a cashless society. "Standardized authentication services on microSD and full-size SD memory cards would transform consumers' mobile phones and CE devices into electronic wallets carrying cashless currency and paperless identification for use in making everyday purchases such as groceries or train tickets, or in receiving customized subscription services like mobile television," it read. I don't know whether the Bible predicts that society will become completely cashless during the last days or not. We are only told in Revelation 13 that without the mark of the beast, no man should buy or sell. Whether the mark will be used as a method of payment itself, or solely as a means of identification, we are not really told. We are only told that “no man might buy or sell, save he that had the mark, or the name of the beast, or the number of his name”, Revelation 13:17. That's why I thought the article on the RFID bracelet was very interesting, for here is an example of this technology being used to prevent someone from buying. And with electronic money being the only acceptable currency at these venues, those who haven't received an RFID bracelet will have a difficult time purchasing anything. That is why a cashless society is ideal from a global governance perspective, because every financial transaction can be traced. Of course RFID bracelets can be lost or stolen. But a microchip in the hand or forehead is a lot harder to steal. And places like the Baja Beach Club in Spain have been using implanted RFID chips as a method of payment for several years. Clearly the technology is already here to fulfil these prophesies. 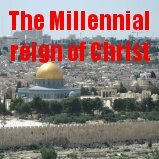 Coupled with the global financial crisis that the Bible predicted would occur during the last days (James 5:3), along with the current political upheaval in the Middle East, the time is ripening for the appearance of a man who will be offered complete control over this world system (Revelation 13:2). Men think that if only they could establish a global government, they could abolish war and bring about an era of peace and prosperity. But it won't happen. There is only one person who is capable of governing this planet. That is Jesus Christ. As Creator He has the sovereign right to do it (John 1:10). As King of the Jews He has the legal right to do it (Zechariah 9:10, Luke 1:32, 33). As the Son of God He has the ability to do it, and on several counts... He is without sin, and so is able to judge righteously (Isaiah 32:1). He is eternal, and so has no need of a successor (Revelation 11:15). He is all powerful, and so is able to subdue His enemies (Revelation 19:6). And as Redeemer, He has procured the rights to do it (Genesis 47:23). For through our own sins we became slaves to Satan's rule, but Christ has bought us back (Colossians 1:13). Praise God that He is coming soon. Have you trusted Him for salvation? Who else could be more worthy of your trust? Turn away from your sins. Believe on the Lord Jesus Christ for salvation today.